I should start by making a mention about navigating around the towns. The one brilliant thing (that we certainly weren’t expecting) is the incredible 3G mobile coverage throughout Vietnam. Every little town you hit seemed to have a 3G tower no matter how remote it was. This got us out of trouble on more than one occasion as although we had quite detailed maps of the main roads, the little roads within the towns were not covered. Having bought a 3G local Mobifone SIM for the iPhone I was able to whip out google maps on more than one occasion to get us back on track. Moving on to the morning in Pho Chau. We were up again by 6am and made the decision based on the previous days effort that we were already falling behind schedule. We had planned to be in Hoi An by day 4 and wanted to spend a good day and a half there to rest and get fitted up for some suits. At this stage it was still some 600kms away or two full days of riding. As such we decided to cheat a little and head to Dong Hoi and try to jump on a train from there to Danang, thus saving us nearly a full days ride. 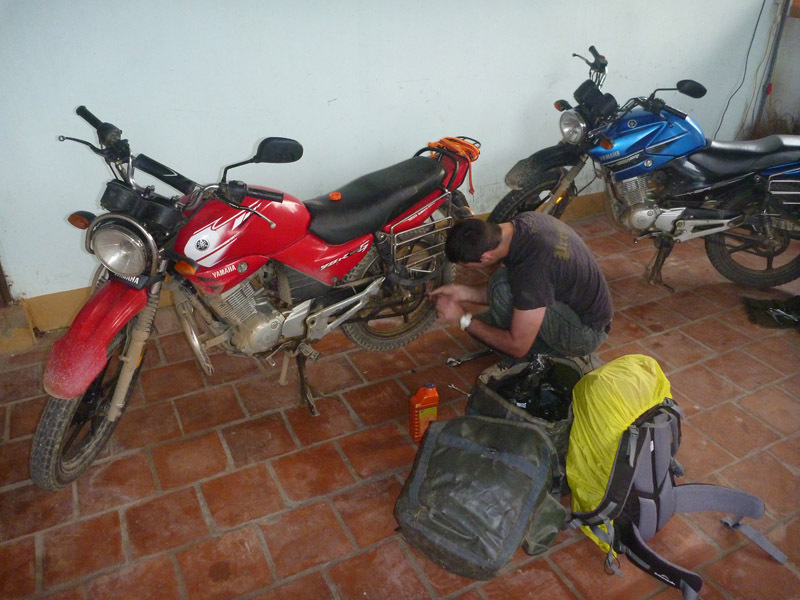 Having had such a big ride the day before it was also time to do a little preventative maintenance on the bikes. As usual Shaun was piss farting around in the morning trying to send emails or chat to his girlfriend so Jarrod and I set about tightening and oiling the chains. Jarrod tightening the chain while I “help” by taking photos. 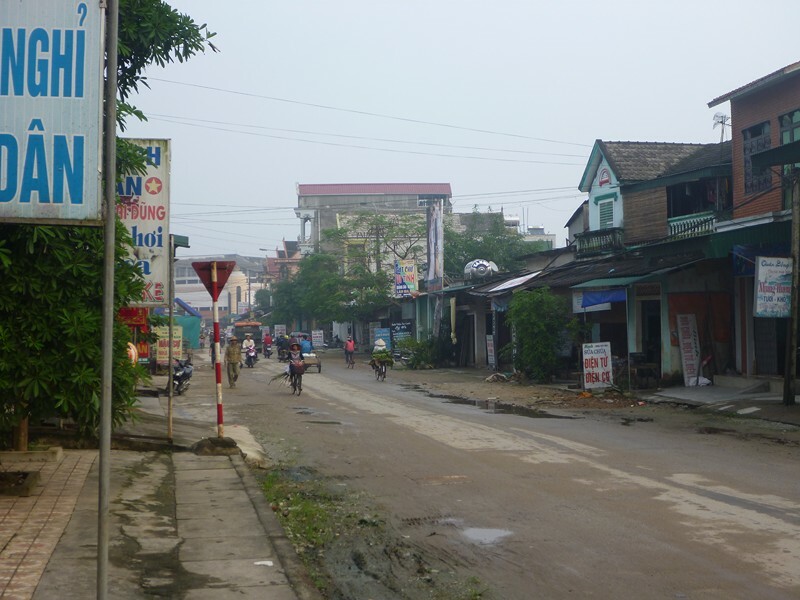 The streets of Pho Chau in the morning. A very simple little town. The reason why Shauno will never be a mechanic (and probably why his sheets have been destroyed). 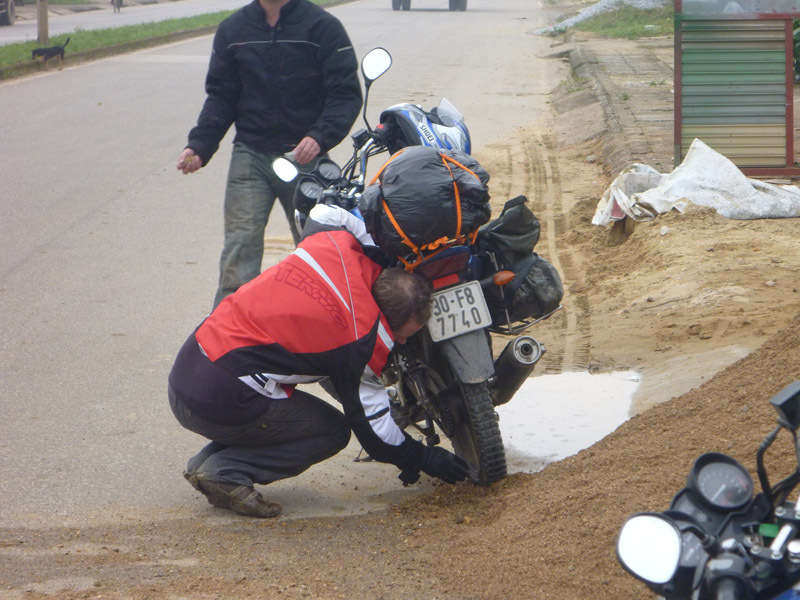 After dangerously letting him loose with the chain lube earlier in the morning he got more on the his rear tyre than the chain and subsequently spent the first stop using sand to try to get it all off. 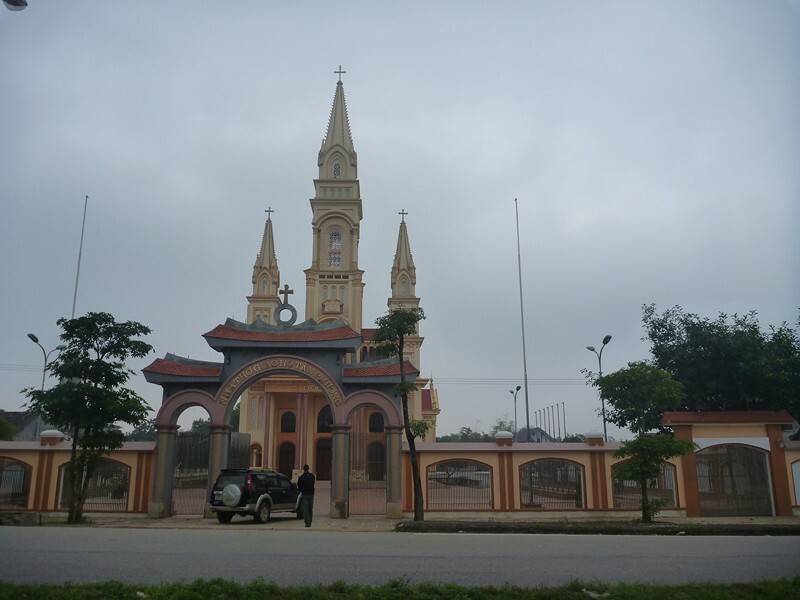 One of the surprisingly regular monstrous churches that would be built in the weirdest of places. It had been a very misty morning which meant the air was very cool and it was pleasant ride in. The downside was that it meant slower going coming through the mountains as you couldn’t see the potholes or cows on the road ahead. Having skipped breakfast in Pho Chau we knocked off about 80km before stopping at Phuc Dong for a late breakfast Pho Bo. Well, we asked for Pho Bo but by the look on the waitresses face and gesturing something in Vietnamese I’m fairly certain we ate some other sort of meat (at times its best not to think too much about what you’re eating). 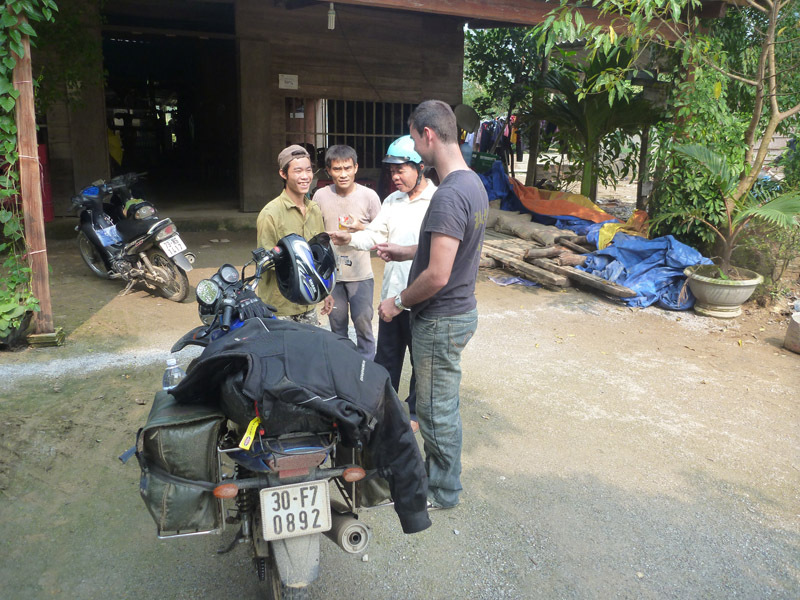 The locals as always, were intrigued by Jarrods helmet cam at our breakfast stop and wanted to have a closer look. Our friend that wanted to give us all a straight blade shave. Admittedly we were looking a bit shabby by that point but as nice as this guy seemed none of us were willing to put our life in his hands. The ride after breakfast turned out to be the best ride of our trip in my opinion. The highway wound itself down from the mountains and into a deep valley with spectacular views either side. The only thing modern in this place was the road. The traffic consisted of no more than the odd push bike and occasional buffalo as we passed through the tiny villages. I really don’t think I can put into words just how incredible this ride was so I’ll let the pictures and video do the talking. School kids on their way home from morning classes. Note the incredibly simple structures in the background. Soon enough the group of kids looking at the bikes grew. They seemed to struggle with the concept of looking at the camera when we were taking pictures though. The bikes and Jarrods helmet cam were far more interesting. What better place to pull out the mullet wigs. 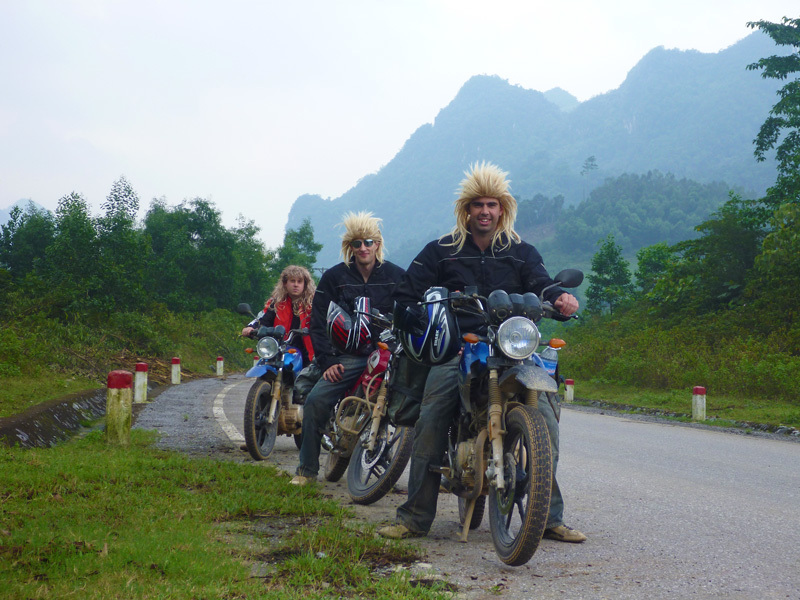 These wigs had served us well at a few parties back home so they had to come along for the motorbike adventure of Vietnam. Three bogans on bikes amongst some of the most amazing scenery in the world. Time for some fun. The first open, straight stretch of decent road we’d see in a long time and it was a chance to test the limits of the bikes. Mud slides were the one big hazard (other than stray buffalo) that we had to deal with on this leg. Nothing wakes you up faster than coming around a corner at 60km/h to find the road covered in mud and rocks. 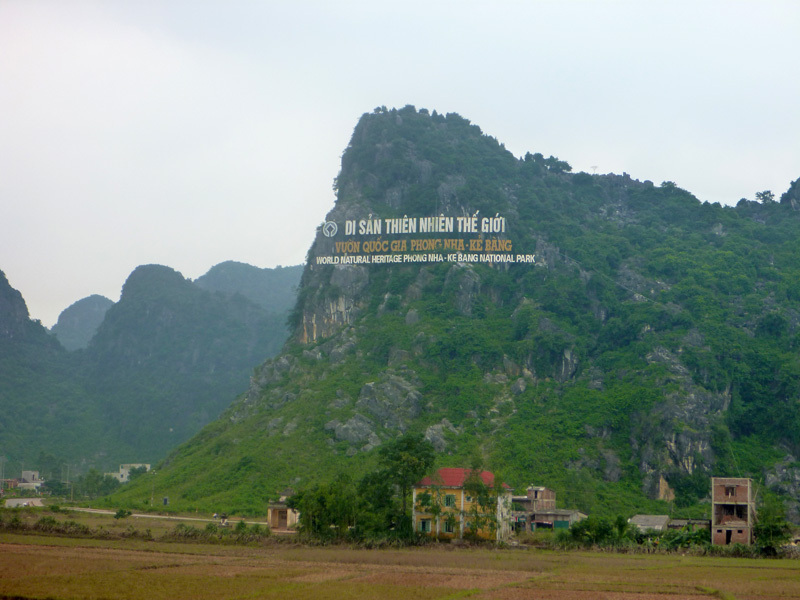 After making our way out of the mountains we reached Phong Nha, famous for the cave system that is believed to be one of the biggest in the world. Although the area is world heritage listed they still took no shame in putting a dirty big sign on the side of the mountain so you certainly can’t miss the turnoff. Unfortunately due to the recent rains that had caused all the mud slides along the way (and flooded most of Thailand) the caves were closed as the water level was too high to get in. We continued on towards Dong Hoi and (thanks to google maps) found our way to the train station by about 2pm ready to sit down and relax on a train for the afternoon. This would not be the case however, as we immediately found out that the information we had gathered on the trains earlier that day had not been entirely correct. 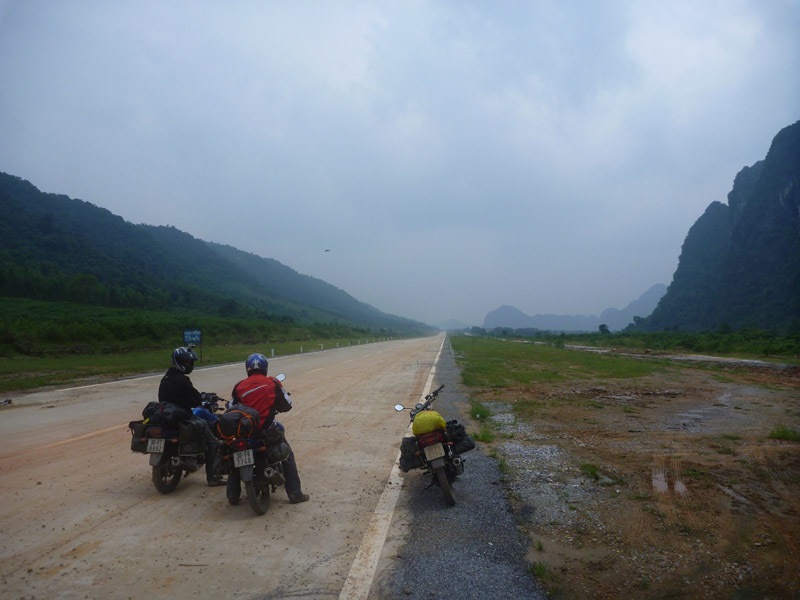 Although we could get on a train at 3pm that would get us into Danang by late evening, our bikes would have to wait until the next day and would not get in until about 3pm in the afternoon. This simply would not work. Realising that we were running out of daylight hours and with the need to cover a significant amount of ground that day we decided we had no option but to push on to Hue (another 180kms away with only about 3 hours of daylight left). Skipping lunch we found our way back to Hwy 1A and started heading south. Barely 5km down the road after dodging never-ending potholes and playing chicken with container trucks we were only averaging about 40km/h and that was never going to get us there in time. 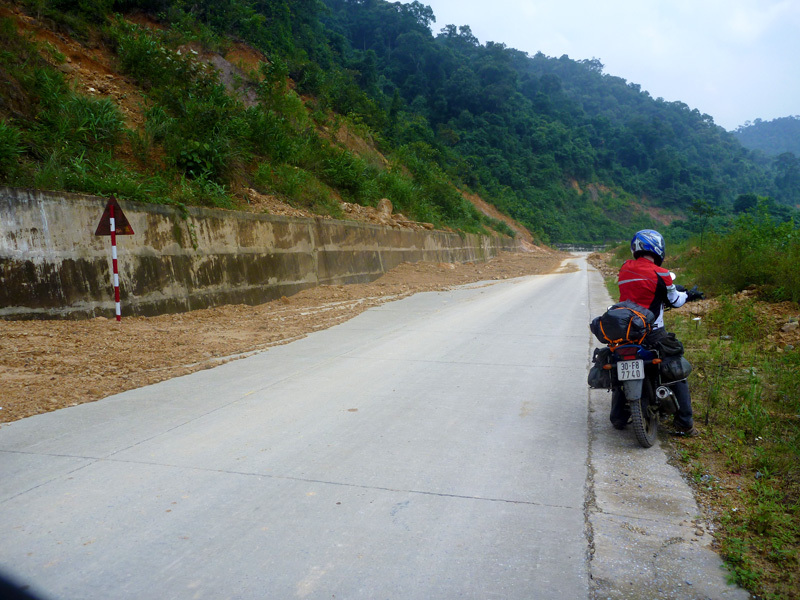 As such we made the decision to wear an extra 15km and cut back into the Ho Chi Minh Trail. This ultimately turned out to be a great decision. Once back on it we were able to cruise at 70-80km/h and started to tick the km’s off in good time. Once at Dong Ha we had no choice but to head back onto Hwy 1A. Thankfully by this stage the road had started to improve, although the traffic hadn’t. With wider roads we were able to further develop our undertaking skills and were cruising past all the cars, busses and trucks on the road. Now I’m sure plenty of bike riders here are horrified that I just said we were undertaking (overtaking on the kerb side) trucks and normally I’d be in the same boat but Vietnam is a little different. There seems to be an unwritten law (although not always followed) that bikes have the right to the 1 to 2 metres of the shoulder of the road and in many place the roads are specifically designed as such. Trucks in particular seemed to be far more aware of riders on the inside than those doing what we consider the “correct” practice of overtaking on the outside or other lane. In fact we seemed to surprise numerous drivers doing it this way and eventually learned that the shoulder was the safer option in most cases. About 40km out of Hue we hit road works just as it was starting to get dark. While all the cars and trucks were ordered to stop, bikes were simply waved through to ride over the freshly laid bitumen. This caused the first major issue for me as to get around the road laying machines we were waved back up onto the other side of the road that at that point was sitting about 3 inches higher than ours. Unfortunately I didn’t quite make the angle of return sharp enough as I was worried about veering into the path of the trucks coming through and my back wheel caught the lip and sent the bike over. Now luckily for me it was at such low speed that although I dropped the bike, I remained standing so I’m not classing it as an “accident”. This is a contentious issue with some of the other guys but for the now I’m sticking with just a “dropped bike”. The bike survived with barely a mark so I dusted it off and we got back on our way. The last 30km into Hue was in complete darkness and seemed to take for ever. Things were even worse for Jarrod who had a tinted visor. When down he couldn’t see a thing other than tail lights and with it up he couldn’t see for the smoke and dust that was being kicked up by the vehicles in front. 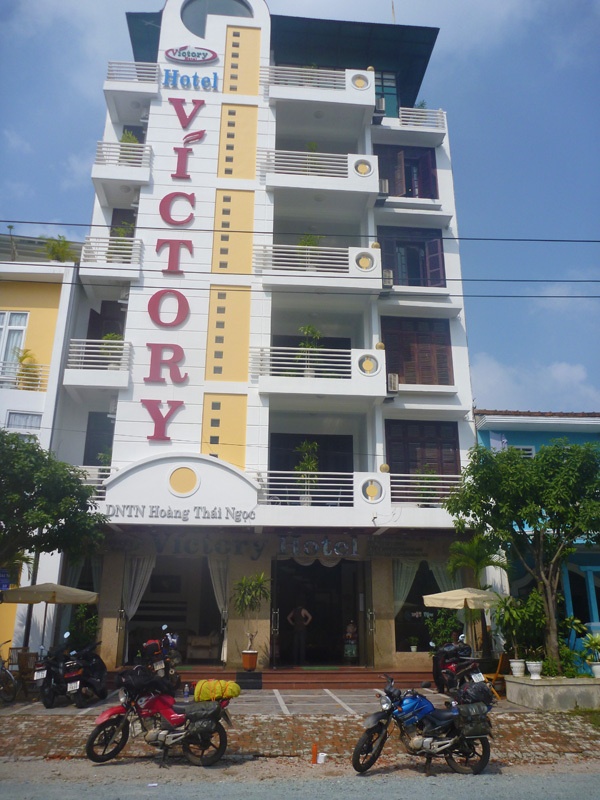 Eventually we made it to Hue at about 6pm and checked into the aptly named Victory Hotel. After the day we’d had it definately felt like a huge victory just to have made it to Hue. We handed in some laundry to be done overnight and found the nearest eatery to get some grub (food) and plenty of fresh cold beers. Shauno, in need of some new t-shirts ducked out to make this purchase. After 10 minutes of ridicule he relented and returned it to the store. Looks like so much fun! I love the picture with the wigs, ha. Thanks for sharing and congrats! Awesome trip … and many thanks for sharing. Good luck and safe travels. Good thing you “helped” by taking the photos, otherwise you may never have been Freshly Pressed! Congrats! These photos are amazing, what a great looking adventure! What a great adventure! I have not yet been to Vietnam but will go some day. Hopefully sooner then latter. Enjoy reading about your adventures! Great pictures. Thanks for sharing! Great shots. You guys looked so funny in the wigs. Loved this. Oh my, what an experience! Sounds like it was awesome! 11 hours?! i commend you. i would worry about a sore crotch and hands. but the scenery is beautiful. and the wigs are lovely. Thanks! I assure you by the last couple of hours of the ride we were stopping every 15 minutes just to give the groin and backside a break. 11 hours is a long time on a bike. Many mates have told me how great Vietnam is.Seeing you guys and great scenery proves this with a doubt. Happy travels.Stay safe. Being a Vietnamese, I am really glad that you guys take your time to have this trip and appreciate the scenery. I think my country has a wonderful nature (though not always properly taken care of). I know you guys are grown men and you know much about safety on the road. But knowing about all the possibility of horrendous accidents that can happen, I urge you to take extreme care when riding near a truck. I know you guys have skills but I know that a lot of the truck drivers do not have licenses and they do not rest enough while driving. The 1A is famous for that. Try to take the side roads if you can because there will be less traffic and the scenery is always much more beautiful. My dad would give anything to be in your position right now. He always dreams of having a bike trip throughout VN but he’s 64 now so the best we can do is by car. Yeah I dont know about the 3G signal problems. As I said we found it to be brilliant almost every where we went but then again i’m comparing it to Australia where as soon as you leave the major cities the coverage is horrendous. I couldn’t agree with you more about staying away from Hwy 1A and the truck drivers. We saw plenty of trucks driven by children, some of whom I supsect would have been lucky to be 15 years old. The scenery on the back roads is far better anyway and if you stick to the HCM trail the roads are generally in far better condition. Fun photos from what looks like a real adventure. Congratulations on being Freshly Pressed. great hair! looks like an amazing trip. Oh wow, this brings back so many memories. My husband and I spent three weeks in Vietnam last Christmas/New Years, and did a motorcycle tour (though not independently!) from Hoi An to Hue over the Ho Chi Minh trail. It was the best part of the trip – I would have loved to do more. Off to read the rest of your entries and reminisce. Thank you. Greetings from Vietnam. 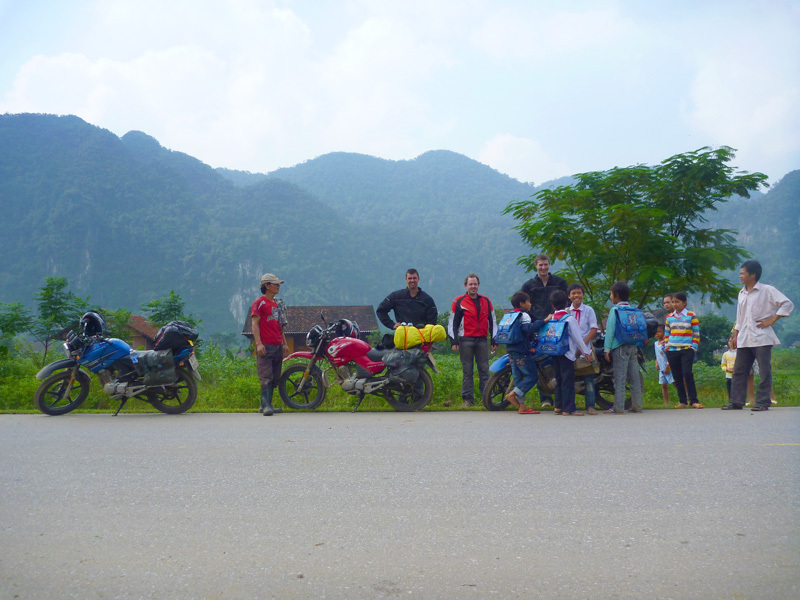 Glad to know you enjoyed the route from Hoian to Hue via Hoi Chi Minh trails. Totally reckon ( except the last 10 km to Hue center). 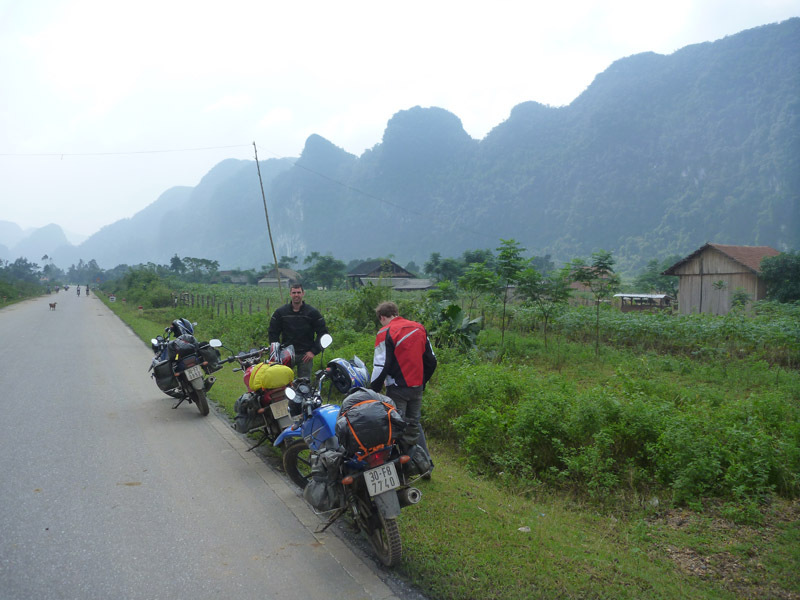 Hope to see you in Vietnam for another motorbike trip. Very amazing and fun i guess. I love adventures it sometimes cleans your mind from all the bad memories.I dont know of Vietnam much because am in Nigeria but i have been hearing about the country. What a great trip! Inspiring, too. I think I need to do something like this. Only downside to your post: I wish Shauno had kept the shirt! Haha.. I’ll let him know at least one other person out there liked it. Whoa. Always wanted to do this. Looks awesome!! Can’t imagine myself getting on a bike that long… Anyway, that was one great adventure you have in there! Love the wigs, the scenery, every bit of it actually! Congrats on being FP’ed! Thanks. It was truely an amazing trip. This is my first attempt at blogging so i’m a little shocked at the front page and the interest its generated. Thanks for taking the time to read. Nice adventure, would love to copy that. That hand signal is a friendly gesture I guess. I don’t know about the rest of Asia but if that thumb-up is used in Singapore or Malaysia, it means ‘GOOD’. Great adventure! I’m planning on doing a long solo trip on a motorcycle. Oh wait. First, I have to learn how to ride a motorcycle. Not that i’m suggesting its a good idea but I had zero experience riding a motorbike on a road before starting this trip. Either way, dont let it hold you back. 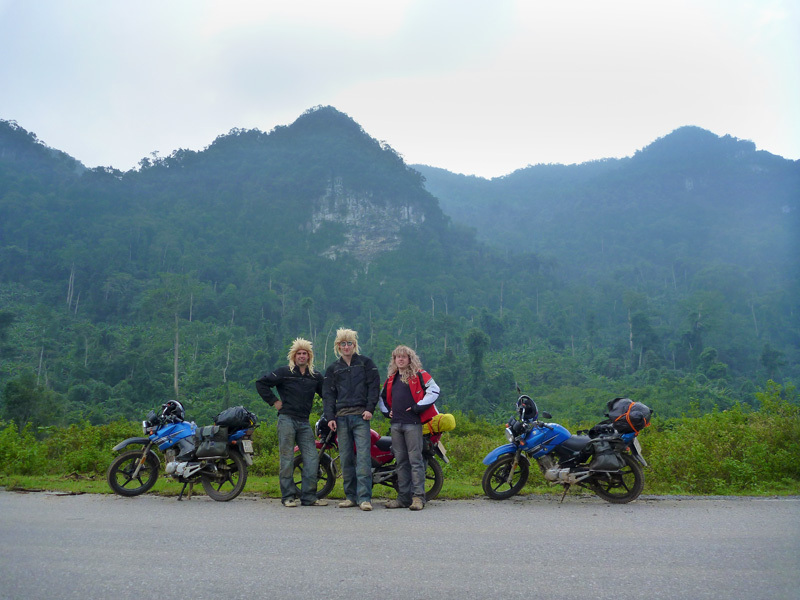 Motorcycling through Vietnam–what an adventure! It looks so green and verdant–well, I guess it is a lot of jungle, lol! Must have been a great trip. Much encounters along the roads. Great adventure. 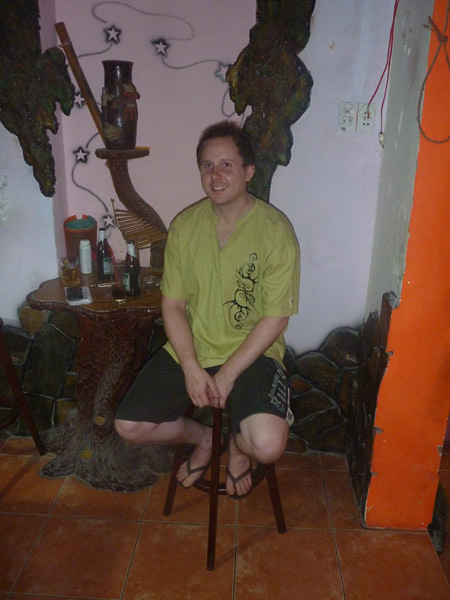 As if you stop by Saigon, I will welcome you a cold beer. For guys who love that such adventure, see me in Saigon for tips with Dos & Dont for motorbike trip in our country. There are few virgin routes for your life time experience. Nice writeup man. I’ve done a lot of riding in Australia but haven’t ventured into SEA yet… this yarn is a real inspiration! Coincidentally I use the same WordPress theme on my blog. Keep riding. Vietnam! My home town! (or is it? considering the fact that I’m Australian-born… my roots are vietnamese I suppose :)) I can’t believe you three wore long pants and jackets! It’s hot (melting point?!) over there! Awesome photos though! It was really only hot in the gear once we got closer to HCMC. The north was quite cool and as long as you kept moving on the bikes the wind kept the temperature down. Two of us did have mesh riding jackets so they breathed pretty well. One was in a leather jacket and he definately felt the heat the most. nice post ….. I have just started following blog…..
Nice photo 🙂 I like it a lot. btw what bike was it…i see Yamaha? is it frazer ? They were Yamaha YBR 125’s. I believe possibly Chinese knock offs but still great little bikes. What a fun trip you guys are having! LOL at your toilet-break picture. I really enjoyed reading your trip in Vietnam. It really refreshes my memories of Vietnam. Bon voyage! The pic with the simple structures and the youth on bikes is awesome! This is excellent stuff. I’m off to find the start of the story. 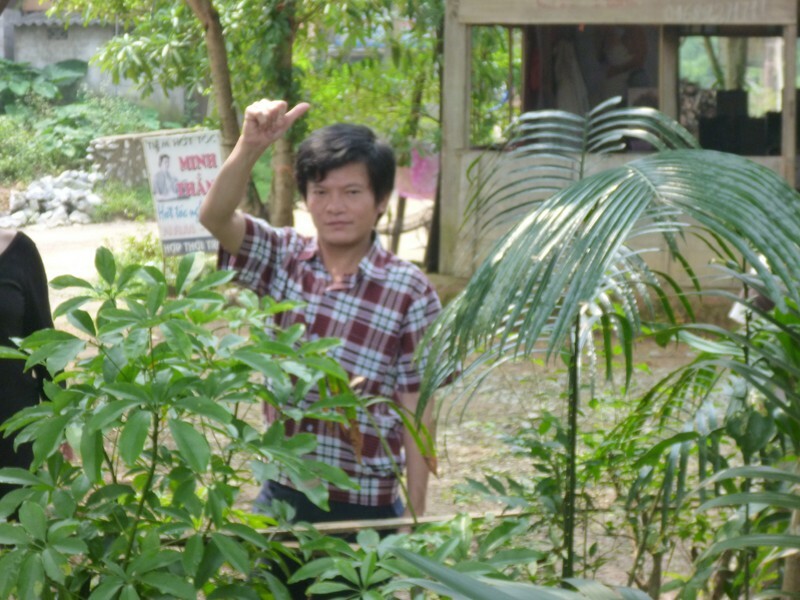 My wife and I have been on a tour of Vietnam, but without the excitement that you enjoyed. Mind we are too old for that. Australia, Canada, Sth America, then Vietnam! Best of luck with your travels. Nice ride. 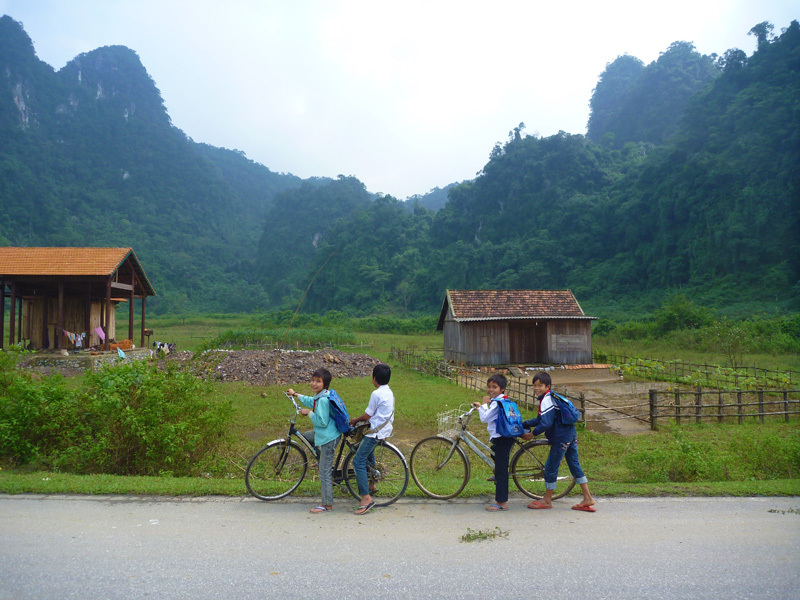 A couple summers ago I cycled through Laos and loved every minute of it, particularly the remote villages. Also love the pictures of the Kharst hills, awesome. What a fantastic adventure! . 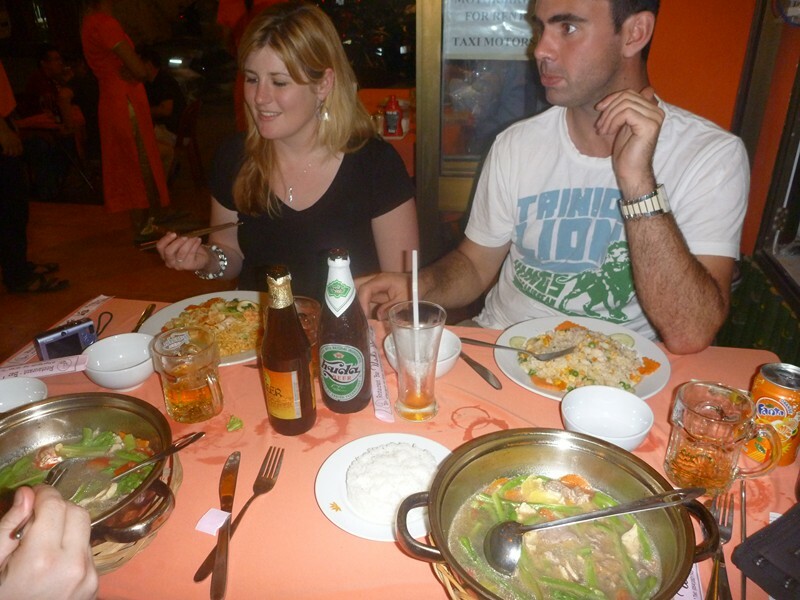 . . We just had friends come back from visiting Vietnam and they loved it! My husband SO wants to go! How amazing! These are amazing photos! Sounds like you have a fun fun adventure. Thanks for posting the photos. Welcome to Vietnam and thanks for sharing your great time here to friends. Love it! Yes we have hours of video we are just sorting through at the moment. I didn’t realise this was going to get Freshly Pressed so wasn’t expecting the popularity so soon. I hope to have some video up in the next week or so. Nice wigs! What an adventure! Buenas fotos, felicitaciones, espero que ustedes puedan tener la traducción al Ingles, Yo Soy guatemalteco, Centro Americano. nice scenery i would also like to go for a road trip out somewhere ..
You have the best header – and hairstyles – on WordPress! Well done!